Diabetic Eye Disease Month focuses attention on keeping our eyes healthy. Each November, vision care organizations, physicians, ophthalmologists, and opticians share resources on how diabetes can decrease your sight. According to the National Eye Institute, over 7 million Americans are impacted by diabetic retinopathy, a condition involving chronic high blood sugar that damages the retina’s blood vessels. If you have diabetes, learn how to properly maintain your eyesight. If not, err on the side of caution and schedule your annual eye exam. This was a groundbreaking report revealing that high-risk premature infants gained better vision potential with early treatment. ​An Early Manifest Glaucoma Trial showed that treating early-stage glaucoma patients can slow the disease. The NEI was named the primary agency for a new vision education project as part of the U.S. Department of Health and Human Services People 2010 initiative. It confirmed the 95% success rate for the current treatment plans used in maintaining vision. ​The National Eye Institute became the first government agency exclusively committed to research on human visual diseases and disorders, a cause championed by LBJ. If you suspect you may have diabetes or you have unsettling eye disease symptoms, use Diabetes Eye Disease Month as a way to conquer your anxiety and get proactive about your health. Various tests, including fasting or drinking a sugary, high glucose solution and then taking a blood test, will give you an accurate reading of the results. There are also certain factors during an eye exam that may indicate diabetes if you have not been formerly diagnosed. Whichever way you go, use this month to take action. Cute pictures of kitty cats and puppy dogs may relieve our boredom on social media but use your platforms to save eyesight in November. Remind your friends, and friends of friends, that November is Diabetic Eye Disease Month. Throw up some stats and maybe some links to organizations that are working on this issue. In December, you can go back and re-post your photos of doggies and kitties. Being a friend includes being there for someone, even accompanying them to an eye exam. It seems like a little thing but if your eyes seem to be playing tricks on you, bring along a friend for support. After all, if your eyes are dilated after the exam, you may need a ride home. ​Diabetic retinopathy often goes unnoticed until symptoms are so severe that you are at risk of completely losing your vision. ​Diabetes is the leading cause of blindness with 40-45 percent affected by diabetic retinopathy. ​Because people of different ethnic groups are prone to developing type 2 diabetes, African-Americans, Mexican-Americans, Native Hawaiians, Pacific Islanders, and Asian-Americans are collectively at higher risk for diabetic eye diseases. ​Prevention is key because taking positive steps like watching what you eat, regular exercise, and correctly taking your diabetes medicine can prevent or even delay any vision loss. Think about all the ways you use your eyes, and now think about how you would feel if you were to gradually lose your eyesight. Diabetic eye disease, also known as diabetic retinopathy, is a group of eye conditions affecting people with diabetes. These conditions include cataracts (clouding of the eye’s lens), glaucoma (elevated pressure inside the eye), and macular swelling (optic nerve damage). 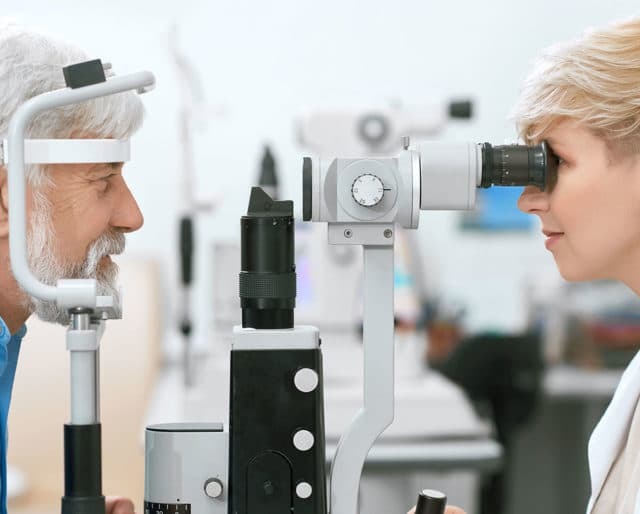 The National Institute of Diabetes and Digestive and Kidney Diseases suggests seeing your doctor if you have blurry or frequently changing vision, experience dark areas or vision loss, or if you see "floaters" or flashes of light. If you have diabetes, you need a more in-depth exam where the eye doctor dilates your eyes. This means you will receive drops in your eyes to make the pupils larger. This allows the doctor to fully see the back of each eye including the retina, blood vessels, and optic nerve. After your eyes are dilated, don't panic if your vision is slightly blurry for a couple of hours — but make sure to arrange for transportation.